Held on the first Sunday in September in Blondin Park, this popular event is free to enter and is a community engagement day for all the family ? enjoy some sun in the park on the last weekend before the school term begins. 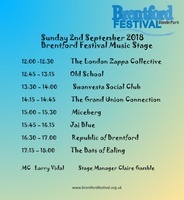 The first Brentford Festival took place in 2005 and has grown into a major community event in West London with visitors growing from 3,000 to over 10,000. This year we have live music, food, classic vehicle displays and local craft stalls.